As illustrated in The Strand interview1, W.S. Gilbert was a thorough stage manager, who planned everything in great detail. His need for detail involved having exact replicas of the stage, actors and scenes created, so he could plan, in depth, exactly who should be on stage at any given time. This is possibly why he was revered so much, as a highly skilled stage manager – his attention to detail made that possible. Gilbert believed that it was part of the authors right, to direct his own plays. He believed so passionately in this, he insisted all of his contracts and stipulations included a proviso that he be paramount in the stage management of his plays. He liked to control all aspects of his plays, including supervising costume design and creation. He was strongly influenced by the playwrights James Planche and Tom Robertson. Attending rehearsals directed by them, in order to glean the latest innovations in stagecraft. This included the notion that all actors should know their words perfectly and obey his stage directions – something that was unheard of at that time. Gilbert had strong opinions and closely supervised rehearsals – making sure his actors didn’t add in any unauthorised additions. At that time, it was usual for actors to alter a piece as they saw fit, and it was common practice for them to frequently do so. This is why Gilbert insisted they know their lines off-by-heart. He also took to hiring many relative or absolute novice actors, as he believed they had no ‘bad’ habits that needed undoing, and would gladly follow his orders. Once Gilbert had the stage, actor and scene details, he would sit and work out each character’s position in each of the scenes, before writing them all down ready for rehearsals. He intricately planned every move actors made on stage, prior to rehearsals. This started with an exact model of the stage being made to half-inch scale. Gilbert insisted that the stage model show every entrance and exit, so he could work out the position of every character, along with their intro and exit strategies. Using little blocks of wood to illustrate the actors, these blocks of wood were made to exact measurements too. Male actors were created using blocks of wood three inches high, female actors were depicted with wood only two and a half inches high. Not only that, but the wooden blocks were also painted to show the different singing voices too – striped to dictate whether they were tenor, soprano, contralto or bass – and he would spend ages, experimenting with effects, which he sometimes printed off, for the actors to use. 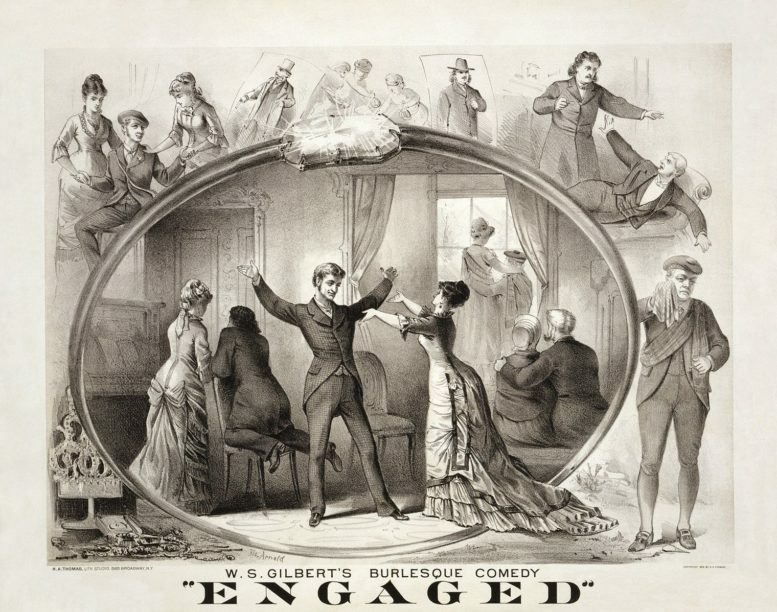 Rehearsals would begin six weeks before opening and, Gilbert would be seen, enthusiastically within the chorus, helping actors perfect tiny facial movements and gestures, and gaining him the reputation as a martinet2. However, he was never explosive and instead, was often seen patiently demonstrating to an actor how to perfect the art of a seemingly simple, yet crucial movement. However, he would show his wrath with actors who compromised on the libretto text itself. He was known to fine actor’s half a week’s salary, if the deviated or added their own gags!